In a post on Facebook social media, a friend recently asked me to comment on the dastardly Enugu massacre by the barbaric Fulani herdsmen, on the basis that I was a core President Muhammadu Buhari supporter during the campaign for March 28 presidential election in Nigeria. Firstly, I'd say may the gentle souls of the deceased rest in perfect peace... Amen. Secondly, that I ceaselessly wrote for Buhari as against the-then President Goodluck Jonathan who happen to be from the same geopolitical zone as I am does not mean I cannot lambast PMB, the presidency or the Nigerian leadership as a whole if need be. Nevertheless, on the current Fulani herdsmen issue, if you ask me, I would say categorically that it did not start today. It's been in the system for ages. I remember during my secondary school days, they silently killed villagers in Delta state on some occasions owing to the fact that a hunter's local trap caught and killed one or more cows. But what did the law do? It kept mute! It might interest one to know that up until this moment, an average Nigerian could be arrested by the police for having a spanner or screw driver (for work purposes) in his pocket, but a Fulani herdsman has never been arrested for carrying dagger or sword about. 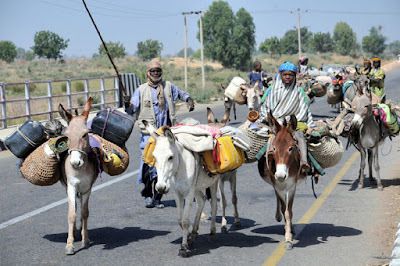 The Fulani herdsmen are not only from Nigeria but also from other West African countries. In line with this, it is not right to begin to pick up a fight with anyone from the North for this evil act. It is also not right to say that PMB is responsible for the act carried out or being carried out by the Fulani herdsmen. It is not right to say a president is about to engineer tribal war in Nigeria. It is not right to say the president has been liaising with Islamic countries to back him up in case a war begins. It is rather those who have the opportunities to share thoughts on social media that are encouraging war where there shouldn't be one. One can reprimand the president and the presidency for being sluggish or having not performed as expected, it is wrong for one to say he is responsible for the killings. However, it is unfortunate that the security of lives in Nigeria has been and still is extremely porous. It is unfortunate that the leaders will definitely not react or act the way we want them to simply because we are angry about the killing of our relations. I feel for the lost souls and I am also angry because I had personally thought that the emergence of PMB would go a long way to help curb the Boko Haram insurgency and the herdsmen violence against innocent Nigerians since he's from the North. I had also thought that the BH emergence was to destabilise the GEJ-led administration, but with its continued attacks of various forms, it is apparent that such callosity is set to not only destabilise Nigeria but also to disintegrate Nigerians. The Northerners live in fear on daily basis, other areas are at alert as well. The point is that we all have a common enemy. I see posts and comments of some of my friends on various platforms urging fellow Nigerians, fellow Igbos, fellow Niger Deltans to pick up arms against Northerners. It is a pity, warring is not the best. It is a despicable piece of admonition from young people of this day. When the war starts, I'm sure these guys will be the first to hide. Our own governors, Assembly, Reps and Senate members, traditional rulers and heads of churches who are being affected by such menace wouldn't even make any attempt to remedy the situation. They will rather go about winning and dinning with the presidency instead of confronting the situation and the president himself for him to provide adequate security for those still living. Police officers are even more scared than the ordinary citizens. Thus, who will protect who? The issue of Fulani herdsmen has lingered for too long, it is in unity alone that we can place out this evil. The problem is after arresting these guys, they go scot-free in the end. For those who have followers or fans (if you like), you are bigger than inciting people. Do not use this as an opportunity to preach hate based on your already perceived prejudice. There are better ways to express anger. I'd say finally that these herdsmen's killings are a situation that tests the president's sense of judgement for a decision against the act. You know why? Because he's Fulani! But if we do not engender peace, we will definitely endanger unity of the country. Our request is that the herdsmen should leave our communities for peace to reign. I don't give a crap about Buhari and his people.